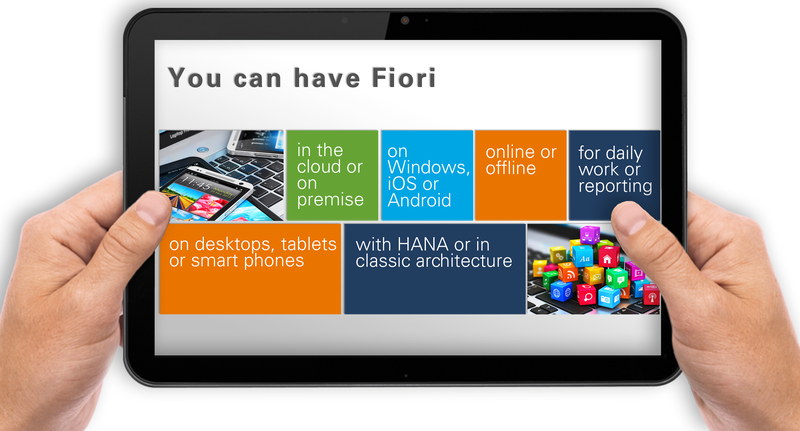 Fiori or more precisely Fiori UX is a new User Experience based on web technology. You have very likely already heard that or seen some presentations and demos. With Fiori you can have good, modern and intuitive user interfaces to operate with your SAP systems. There are plenty of apps available and ready to use. And there are tools and technology to modify existing apps or even create new apps tailored to your needs. The Fiori ecosystem is growing rapidly and offers many options for various use cases and scenarios. Where can I use Fiori? Let us help you with that. Knowing the products and technologies we can tell you how and when to use Fiori, SAPUI5, SAP Gateway, HANA Cloud Platform, Fiori Client, OData, Mobile Platform, Mobility Service etc. But technology is not everything. A solid and deep understanding of your processes is also required. Finding the right apps to meet your requirements. Setting up a suitable infrastructure. Extending and modifying apps to suit your requirements even better. Creating a custom-developed app to match to your requirements and needs perfectly if necessary.